I had the chance to ask Matt Chandler some questions about his new book “To Live is Christ, To Die is Gain.” Matt Chandler is a best-selling author and pastor of The Village Church in Highland, TX. Enjoy this interview done for Crossings Books. Kevin Syes: What inspired you to write your new book, To Live Is Christ, To Die Is Gain? Matt Chandler: Before it was a book it was small group curriculum, but I wanted to tweak the original content and write on progressive sanctification in a way that was encouraging and simple. After my conversion my development was built out as following a moral code. I did some of it well, and other parts of the code I struggled to fulfill, which saturated my heart with guilt rather than conviction, and my life with shame rather than delight. The Holy Spirit used Philippians to awaken my heart to having my affections stirred by Christ, and filling my life with the things that made me marvel at God’s goodness and grace. That helped me put to death the things that were sinful in me more effectively. Kevin Syes: To Live Is Christ confronts the issue of spiritual development—what’s your best piece of advice for becoming a mature Christian? What do you envision a “mature Christian” to be? Matt Chandler: I alluded to it above, but I believe the bible teaches that if you fill your life with the things that stir your affections for Jesus, and avoid the things that rob your affections, while simultaneously seeking to put your sin to death, you’ll mature in a more visible and manifest way. Kevin Syes: Your book is grounded in Paul’s letter to the Philippians. How can Paul’s story help modern-day Christians grow in their faith? Matt Chandler: The story we read about in Philippians is our story. We were rescued by Christ, have a tendency to wander, and are helped and held by our redeemer. The implications of that shape everything else in our lives, from relationships to money. Kevin Syes: Philippians 1 says: “to live is Christ, and to die is gain”—why did you title your book after this verse? What special meaning does it hold for you? Matt Chandler: I think everyone assumes the title is somehow tied to my battle with brain cancer but it’s not. I think that simple line encompasses almost everything I want for me, my family, and the church I serve. To have my life, family, and church shaped by, lead by, and empowered by the Holy Spirit making much of Jesus through our lives and voices and to rejoice in the reality that death is dead. Kevin Syes: You mention in the book that the book of Philippians is filled with “coffee cup” verses. While we all love these verses, do you feel that the focus on these well-known verses has actually caused us to miss the heart of the message of Philippians at times? Matt Chandler: There is no question that has happened. It happens with most “coffee cup” verses. The most glaring example would be the proof texting of Philippians 4:13, which says, “I can do all things through Him who strengthens me.” I’ve heard and seen this verse be used around sports and other such activities to teach on our ability to accomplish feats of strength and might. The text is talking about contentment though. Kevin Syes: What is the one thing you hope people walk away with from this book? Matt Chandler: I want people walking away with hope. That the God who saved them has every intention of sanctifying them. It might not feel like a 6 lane super highway, but God is a work. Trust him, press into him, He cares for you. Kevin Syes: How does the message of your book relate to the message of The Gospel Tour? Matt Chandler: The Tour has been a lot of fun. I’ve simply been teaching Philippians 3 and asking the Spirit of God to work on the hearts of tired people. Kevin Syes: How did the idea of The Gospel Tour get started? Matt Chandler: We (Tullian, David C. Cook, Doug Hudson) began talking about what it might look like to try and encourage men and women with a night full of gospel goodness. I was a bit hesitant at first because of scheduling but it’s worked out, and God has done some mighty things. Kevin Syes: What do you hope audience members take away from this tour? 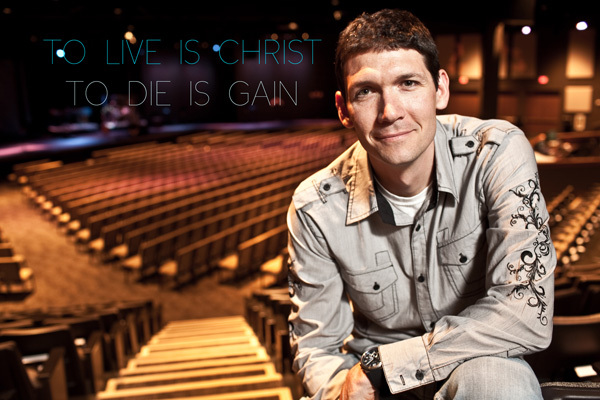 Matt Chandler: My hope for the tour is my same hope for the book. To encourage the saints and be used by God as a conduit of hope in the journey toward Christlikeness. Kevin Syes: Well Matt, thanks so much for your time and insight! Well done on a great book!